Ornate, but not too "over-the-top", this beautifully handcrafted 2-tone bracelet showcases the best of Balinese craftsmanship. Its sparkling purple amethyst stones, set in polished silver, create an easy-to-wear piece that's perfect for dressing up most any outfit. 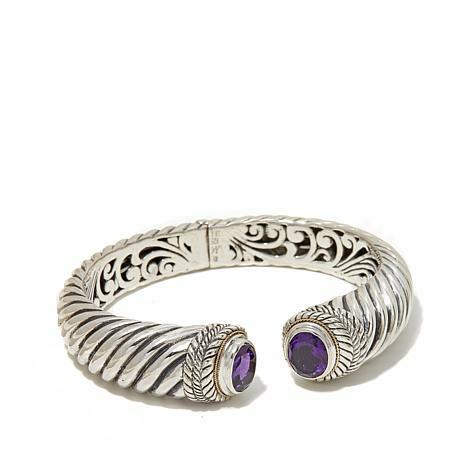 Today I received and feel extremely happy with the awesome, beautiful, lovely Bali Designs 5.2 Amethyst Hinged Cuff 2-Tone Bracelet, by Robert Manse. 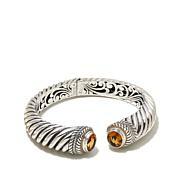 As beautiful as the other Bali Designs cuff's. 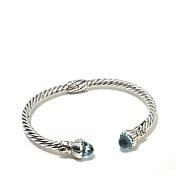 Now I am very interested to by the Blue Topaz stone Hinged Cuff-2 Tone Bracelet. Thank you HSN and Robert Manse. Exquisite, heavy but comfortable. Rich, deep amythyst. The small fits my tiny wrist perfectly. I can even work on my computer without a problem. Well worth the money! Love it! 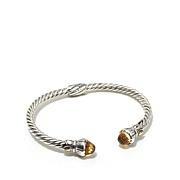 Stunning, that is how I describe the bracelet. The topaz is a Caribbean blue sea. Got it as Christmas present from my husband, like it so much I ordered another color. Im out of words to describe the bracelet. This cuff literally took my breath away when I opened the box. The blue topaz is beautiful. Reminds me of the waters of the Caribbean. The cuff design is beautiful and very comfortable. A love affair with these cuffs has begun. If I could give it 10 stars i would. The blue topaz in this bracelet is breathtaking. I thought I would be happy with one of these when I purchased the black spinel, which is gorgeous. However, with the special price it made sense to try the blue. So happy I did.